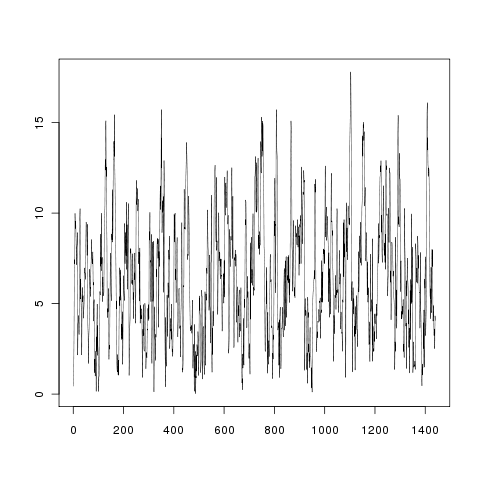 How to simulate wind speed time series with R | Omnia sunt Communia! #The iterative procedure should stop when reaching a predefined error. However, for simplicity I have only constructed a for loop. To be improved! ##where the 0.5 correction is needed since the the WindSpeed vector is centered around the mean value of each category. I’m very interested in modifying your script to include these three parameters, and wonder if there is a modified version of it. I wrote this provisional script for a data analysis. Finally I didn’t get involved in that analysis and couldn’t find time to improve this script. Please, let me know if you modify it to include more parameters. Very interesting!! Do you think its posible to obtain the wind rose? and the distribution depending the elevation? I am thinking to include your script in our project to study the feasibility for an offshore wind power plant in different locations. The wind speed distribution changes with the altitude. Therefore you can use this procedure tuning the values of MeanSpeed and MaxSpeed (and perhaps the distribution function…). But first you have to generate the wind directions sequence. You can use the procedure I described provided you know some information about the probabilistic distribution of the wind directions. For wind speeds Rayleigh and Weibull functions are particularly recommendable, but I am not so sure if it’s correct for directions. Did you implemented the wind direction so far? No, Mirco. I have not worked on this code anymore.